Tuesday, 13 September 2011, Day 294/365. Sometimes I love the way photos turn out. For this one I noticed the extra detail, something I might normally walk past. 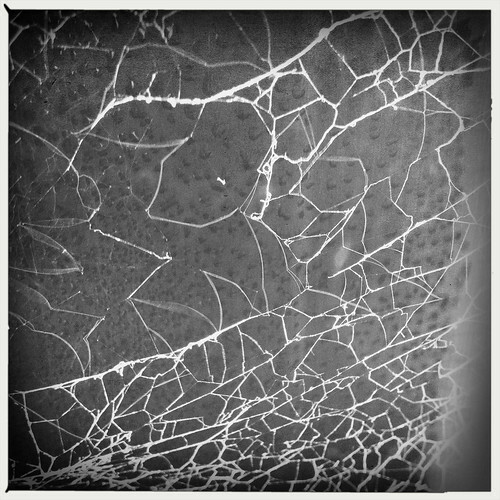 Incase you can’t tell, this is a spider web. It’s on a fence and I took it on our morning walk. I probably had to stop when Monty stopped to have a sniff at something and that’s when I noticed it. The term ‘the web’ means a lot more to me too because it’s the area of work that I’m involved in and love doing. Even though I have some contract work at the moment I still apply for longer term jobs as they arise. I went for an interview a few weeks ago and thought I did pretty well but found out that I was unsuccessful. I’ve asked for some feedback but have yet to hear and think that I may not. I know it’s a difficult phone call to have, the sorry you weren’t quite what we were looking for as an employee phone call, but as I took a lot of my time to write an application and get ready for and attend an interview surely I’m entitled to some feedback? So I’m left wondering if my skills weren’t quite up to scratch, or they thought I might not be a good team fit or perhaps it was something else entirely? I pick myself on and move on to the next possibility, write yet another job application when the opportunity arises. Or perhaps I’m destined for more contract work? I do quite like it even though it’s not quite the work that I’d ideally like to be doing, I am learning things. Does the spider know what it’s doing next when it weaves its web? I sure don’t. That is a really, really awesome picture. Sorry about the interview, though! Thanks for the picture feedback. And I got feedback about the interview. Someone just had more experience in an area I didn’t. I came second apparently.